The objective of any prosthodontic service is to restore the patient to normal function, contour, esthetics, speech, and health. An optimum denture stability is difficult to achieve in conventional complete dentures. This problem is more magnified in mandibular dentures. The design of prostheses to replace lost teeth and resorbed ridges is largely determined by the position and amount of morphological change in the denture-bearing area of the jaws. A neutral zone may be defined as the space where, during function, the forces of the lips and cheeks pressing inward neutralize the forces of the tongue pressing outward. The neutral zone concept implies acquired muscle control, especially by tongue, lips, and cheeks toward the denture stability. Advocates of the neutral zone concept agree that a lack of favorable leverage is observed when teeth are positioned directly over the ridge. By employing the neutral zone concept, the dislodging muscle energy can easily become a retentive and stabilizing force. 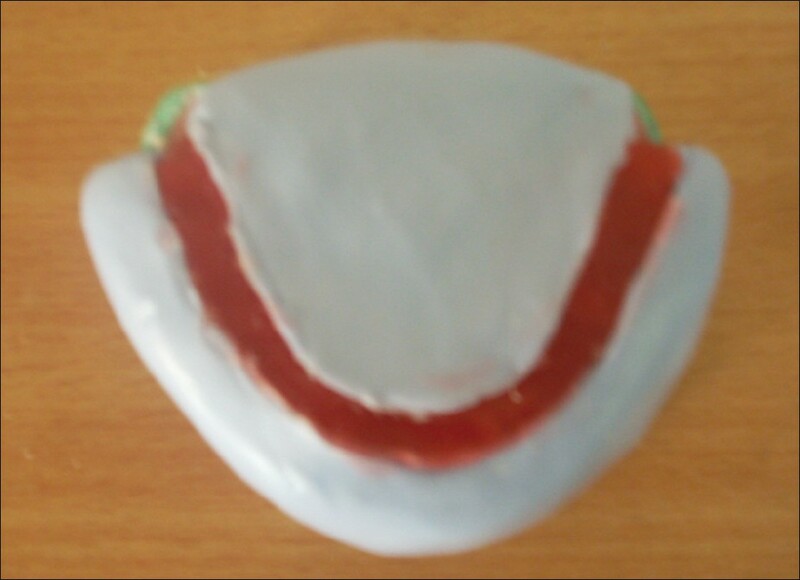 The management of a mandibular resorbed ridge with a neutral zone technique using an impression compound mixed with a green stick in the ratio of 3:7 has been described. 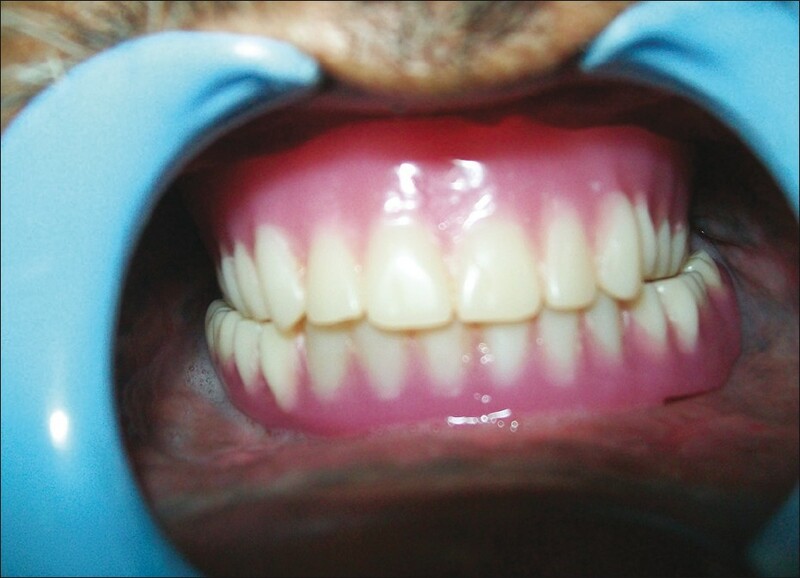 A male patient named Mr. Y. S. Saxena aged 65 years presented to the department of prosthodontics with completely edentulous and severely resorbed mandibular ridge [Figure 1]. The patient also presented with epulis fissuratum in both upper and lower arches, fissured tongue, and angular cheilitis [Figure 2]. On intraoral examination, tongue was found to be fissured with macroglossia. The mandibular arch was severely resorbed (Atwood's class IV) with a shallow sulcus depth. The patient was wearing denture for the last 10 years, but was not satisfied with it due to reduced vertical dimension. He had also undergone surgery for removal of epulis fissuratum in both jaws 1 month back. The interocclusal space was about 7 mm. Teeth of both the arches were severely attrited and dentures were in class III relation. To rehabilitate the patient with complete denture therapy. To achieve maximum prosthesis stability, comfort, and function. To locate the neutral zone and accordingly arrange the denture teeth and contour the complete denture polished surfaces. To minimize the ongoing diminution of the residual alveolar ridges. Restoration of the lost vertical dimension to about 5 mm. The treatment procedure was explained to the patient. In the first step, primary impressions of the upper and lower jaws were made with an impression compound and poured with an impression plaster. Maxillary and mandibular secondary impressions were made after border molding. Lower secondary impression was made with a light-body elastomeric impression material and was poured by using a plaster-pumice method, and a wax rim was constructed for both arches. At the same time, denture bases were also made for both jaws, which were a plate of acrylic adapted to the respective ridges, without handles, with spurs or fins projecting toward the opposite arches. Wax rims were used to record a tentative vertical dimension and centric relation. The 5 mm of the vertical dimension was also raised from the previous denture. After the jaw relations were established, denture bases were adjusted to these dimensions with softened compound and green stick. The lower denture base with the softened impression compound and green stick in the ratio of 3:7 was placed in the patient's mouth; this tray was very carefully adjusted so that it was not overextended and remained stable during opening, swallowing, and speaking. The patient was then asked to talk, swallow, drink some water, whistling, pursuing the lips, etc. After 5-10 min, the set impression was removed from the mouth and examined. In doing so, reciprocating pressures have been exerted upon the compound, which had gradually molded into a state of neutral balance. An occlusal plane was established for the lower arch by placing the upper wax rim and lower compound rim and guiding the patient to the centric relation. The same procedure was performed for the upper arch with lower wax rim and upper softened compound rim. The occlusal plane in the compound was thus established for both arches at the determined vertical dimension and centric relation [Figure 3]. The putty index was then made for both upper and lower compound rims to recover the occlusal rims in wax. The base and the catalyst were hand-mixed in an equal ratio and adapted to the facial and lingual surfaces of both upper and lower compound rims seated on their respective casts without covering the occlusal surface. After 10 min, the set impression material was carefully removed from the compound rims. The buccal and lingual portions were removed as two separate pieces. The shape of the dentures was now permanently registered in these putty indices [Figure 4]. The impression compound was now destroyed down to the bare acrylic resin. The red baseplate wax was slowly melted in an enamel bowl and poured into the index through the space between the labial and lingual indices on the occlusal surface. When the index was opened, a hard wax duplicate of the low fusing compound had formed. Thus, both upper and lower wax occlusal rims were formed [Figure 5]. The wax trial dentures were tried in the mouth to check the esthetics, phonetics, and occlusion. After finishing and polishing, the denture was inserted and postinsertion instructions were given [Figure 6]. 1. Cagna DR, Massad JJ, Schiesser FJ. The neutral zone revisited: From historical concepts to modern application. J Prosthet Dent 2009;101:405-12. 2. Alfano SG, Leupold RJ. Using the neutral zone to obtain maxillomandibular relationship records for complete denture patients. J Prosthet Dent 2001;85:621-3. 3. Makzoumé JE. Morphologic comparison of two neutral zone impression techniques: A pilot study. J Prosthet Dent 2004;92:563-8. 4. Beresin VE, Schiesser FJ. The neutral zone in complete dentures. J Prosthet Dent 1976;36:356-67. 5. Ohkubo C, Hanatani S, Hosoi T, Mizuno Y. Neutral zone approach for denture fabrication for a partial glossectomy patient: A clinical report. J Prosthet Dent 2000;834:90-3.